Post the expectations for writing time in the front of the room. Although your students will be excited and ready to write, many will get stuck before the hour is up. Although I often ask my students to work in pairs or groups, and talking is a strategy we use to work through writing issues, I know my students (and I) will need the room to be quiet in order to stay focused on our writing. So before we dive into our novels that first day, I go over my expectations for them and offer suggestions for how to keep working when faced with writer’s block. their own NaNo playlist of music: the first year my students wrote novels, the silence in the room (and the tappity-tap of the keyboards) was almost as distracting as too much talking. A student asked about listening to music, and I realized that allowing them to plug in to music on their phones would help them stay focused even more, since they wouldn’t be able to hear other students who might distract them. That was the year we began to challenge the school’s no-phone policy, and since then we have enjoyed many benefits of accessing those mini-computers that so many of our students carry in their pockets. sharing out their own experiences so far: how their story is coming along, what they are learning about writing a novel, how they get past writers’ block, what has surprised them about the process so far. I share about my own novel-in-progress as well, and they are eager to hear about (and offer suggestions for) my own writing struggles. They learn so much through the writing process and love to offer advice to their peers and teacher. inspiration from the world-wide community of WriMos on YouTube: I’m pretty sure it’s more fun to create videos about NaNoWriMo than it is to actually sit in one’s chair and write, so there is no shortage of silly (and informative) videos to share with your students. Not only will they start the day laughing and inspired (with a couple writing tips to boot), but they will also realize that they are part of a phenomenon that stretches across the globe. They are writing novels with people all over the world! Here is a list of our favorite NaNo videos. check in with them on their docs: they have shared their novel draft with me, and I make sure to leave a couple comments on every doc within the first week of writing. That way they know that I am seeing their work, which helps keep them accountable, and I’m able to give quick feedback and encouragement right from the start. best lines: since our novels are still in draft stage, we don’t have polished pieces ready to publish yet. But we all can find one really great line that we are proud to share. Those can be read aloud, copied/pasted into a shared Doc, or printed on index cards to post on a bulletin board. And that’s what NaNoWriMo looks like for us each day in November! It’s all about getting first drafts of our novels written, and my students surprise and amaze me every year with their creativity and enthusiasm. 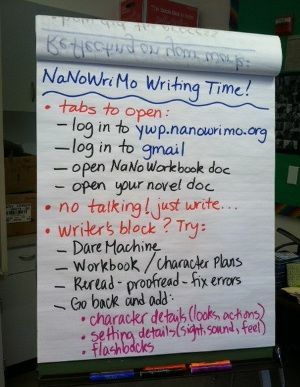 This post is third in a 4-part series on NaNoWriMo in the classroom. Part 1 explains NaNo and its benefits. Part 2 offers tips on getting started. Part 4 is on how to assess your Wri-Mos.